The MagPi magazine is the single thing to have come out of the Raspberry Pi community that I’m proudest of, in a sort of godmotherly way – we at the Raspberry Pi Foundation do not have any association with The MagPi besides thinking it’s the best thing since sliced maltloaf. They’ve got a new Kickstarter running. The MagPi is a monthly free download, full of projects, tutorials, reviews and interviews about the Raspberry Pi. The magazine is staffed entirely by volunteers, and it’s just entering its third year of publication. Last year, the MagPi team served up a Kickstarter to bring the magazine to print, which proved really successful: print copies go down especially well if you’re using the magazine for reference or working through the tutorials. That Kickstarter meant that you could get hold of all of the first year’s magazine in a print version, with a handsome binder to put everything in. We have a couple of the first year’s binders filled with magazines in the office: the Pi Towers team finds the MagPi a really useful resource. Many people have asked for another binder for the second year’s print copies, having accumulated a heap of them at home. So Team MagPi are running a short-duration Kickstarter to fund manufacture of a binder for Vol 2 (i.e. 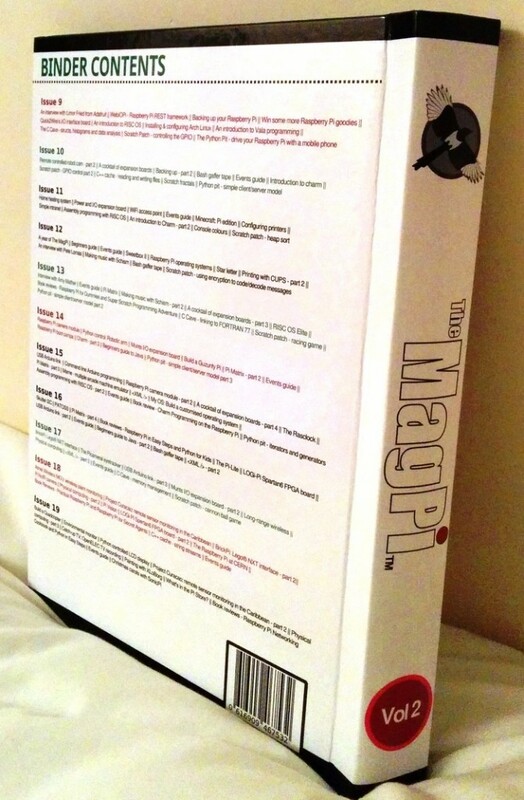 every edition of The MagPi that came out in 2013). They’re keeping it to a two-week funding run because financing a binder costs them much less than last year’s bid to pay for printing what had been a virtual magazine. You can pledge at different levels, so you can fund anything from a sticker, an empty Vol 2 binder for yourself, a Vol 2 binder with all of last year’s magazines inside, or both volumes – complete, of course, with binders. Any extra funding will be used to fund the ongoing costs of producing The MagPi, plus it will allow us to explore other ways of expanding the availability of the magazine, introduce other types of content, and translations to other languages. Any profits after that will be invested into future print runs and the Raspberry Pi community. You can back this project by clicking here, or on any of the images in this post. Good luck, MagPi people – it goes without saying, but we think you’re brilliant! Great project. I noticed it has (more then) quadrupled it’s target already, so IMO there’s little use subscribing to it ATM. However, as I missed the first volume I do like to purchase both volumes, is there another way to obtain these or will that become available after delivery of the volumes ordered via Kickstarter? TIA! When you say another way, do you mean paying by PayPal or something? If so we can accept that now. Or after the Kickstarter you can purchase from retailers. IMHO the success of the MagPi as a magazine is a direct reflection of how great the Raspberry Pi community is as whole. The team works so hard on each and every issue and the results are simply outstanding (yes I do have bias here). 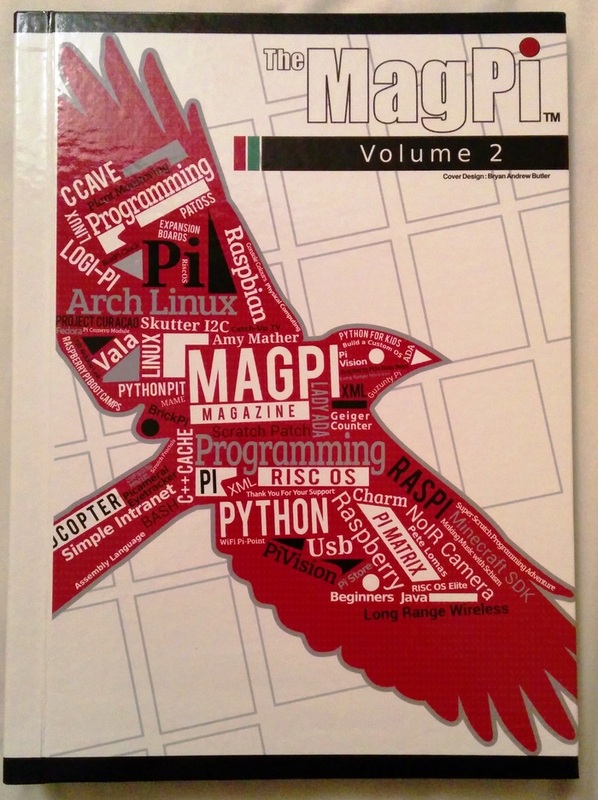 If anyone is looking to do something nice for a local school then I think a volume of MagPi magazines would make an excellent addition. Particularly if the school is starting to use RPi in the classrooms. Just the thing to direct a keen student towards when they’ve got hooked! Hearty agree – we think they’re a great resource for schools, and I’d love to see these binders in even more school libraries. Old. Issue 2, page 22 attributes Daisy to the IBM 7094 in 1961. I heard it on IBM 7090 in 1961 or early 1962. IBM 7094 was not installed for first time until September 1962. This is a minor error, but error none the less. I have seen other wiki references with the same error. But I love MagPi.